A few weeks after this photo was taken in the summer of 2009 the Government axed the county council's plan for building a fast highway though this valley. 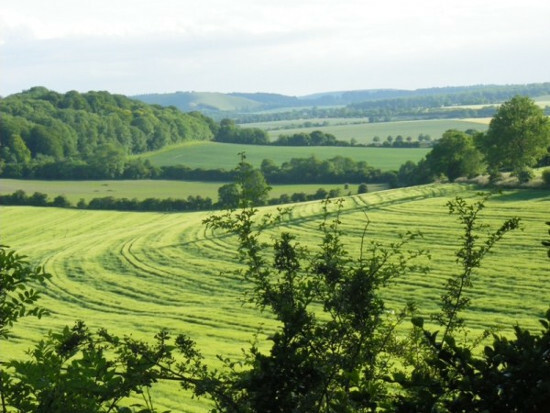 The government echoed the verdict of the planning inquiry inspector that the scheme wasn't good enough to justify the damage it would have done to this spectacular countryside on the edge of Salisbury Plain. Five years later Wiltshire Council still hopes to revive this zombie road - which must be why it is still resisting our proposal that this landscape should be protected as an Area of Outstanding Natural Beauty. The White Horse Alliance is a coalition of organisations campaigning to preserve the countryside around Westbury in Wiltshire and in the Wellhead Valley, which is at the foot of the Westbury White Horse Escarpment. We successfully defeated a proposal for a new road, the A350 Westbury Bypass when the Government rejected it in July 2009 after a public inquiry the previous year. We continue to work for a better plan for transport and the environment in West Wiltshire and the region. The Wellhead Valley and its endangered wildlife remain vulnerable to urban sprawl and road building. The immediate need is for Wiltshire County Council's Core Strategy – a development plan to 2026, to address these concerns. We are also pursuing longer term strategic goals including extending landscape protection for the area, and ensuring environmental policies from the European Union are enforced.